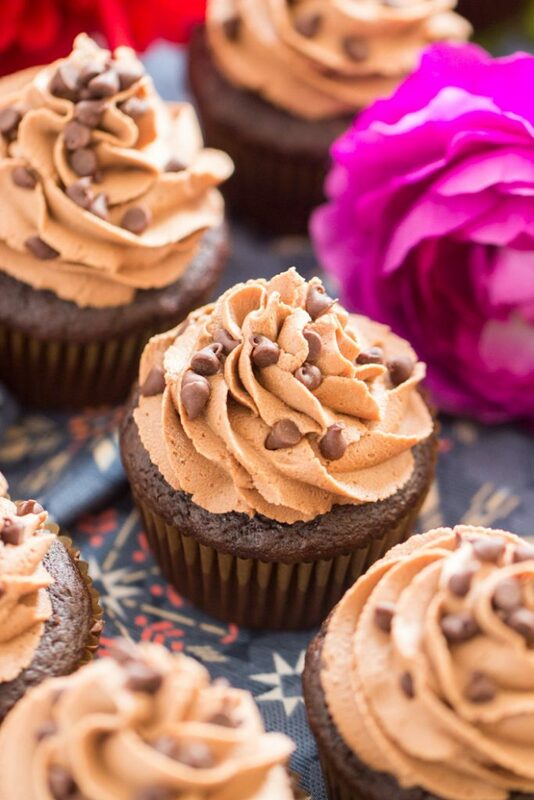 Simple chocolate cupcakes, filled with a heaping mound of Nutella, and topped with fluffy Nutella Buttercream. 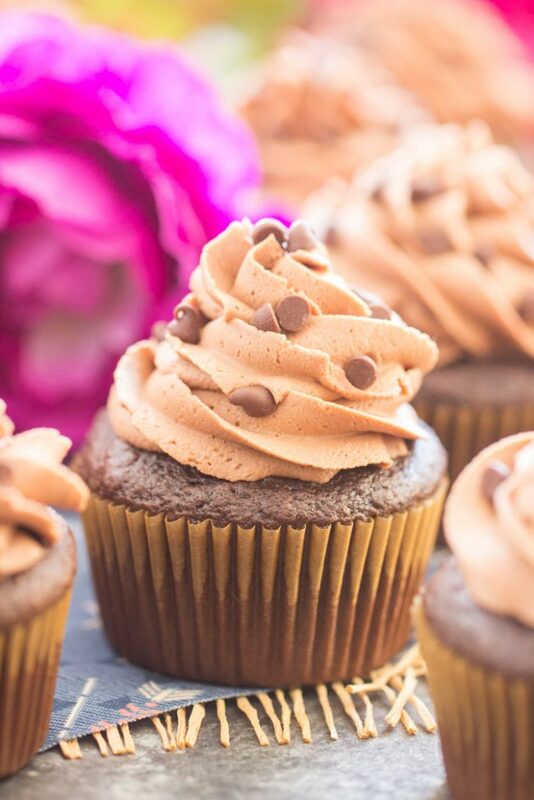 These Chocolate Nutella Cupcakes with Nutella Buttercream are an explosion of chocolate and hazelnut. The best cupcake ever, and they are so easy. Very, very easy, and decadent little show-stoppers. 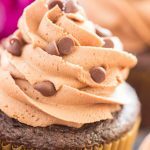 These Chocolate Nutella Cupcakes with Nutella Buttercream are my latest favorite dessert, and one of my favorite cupcakes ever. That actually says a lot because I eat a lot of desserts, but also, I’m not a chocoholic. I really like chocolate, of course, but I’m not a chocoholic at all. 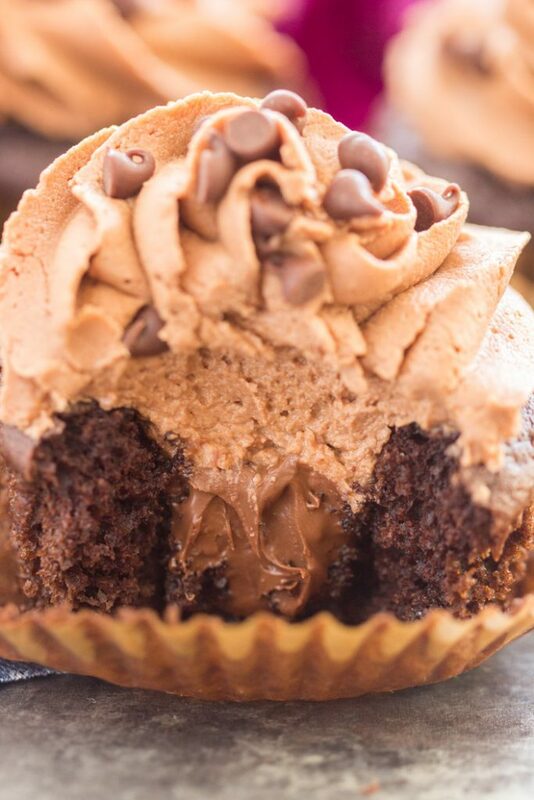 If I rank these Chocolate Nutella Cupcakes near the top of my favorites list, it says a lot. There’s nothing complicated about them. They’re just full of chocolate, and full of Nutella, and those are two wonderful things in life. 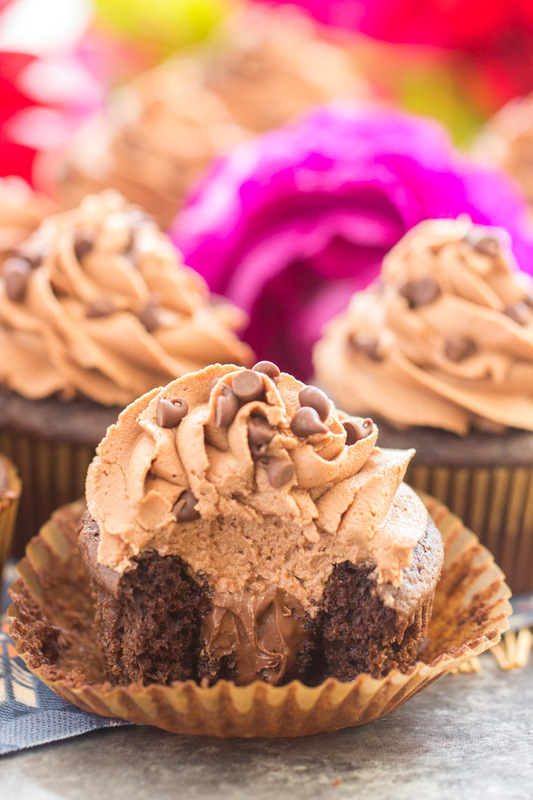 To start, these Chocolate Nutella Cupcakes are simply doctored up cake mix cupcakes. Is it wrong that I like cake mix, and that I have no interest in perfecting a from-scratch chocolate cupcake? Hasn’t it been done a lot already? I just don’t feel a need to accomplish that, and I like cake mixes, especially if they’ve been spruced up with a few extra ingredients than what’s called for on the box. Who’s with me?? 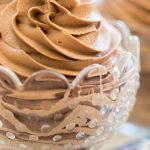 Nutella Buttercream is a cinch to whip up. It just whips up perfectly and effortlessly. Sometimes buttercream frosting can have a mind of its own and can be finicky. You could use the same proportions of butter, powdered sugar, and cream as always, but it turns out different. Nutella Buttercream is not fickle. It always whips up reliably fluffy and thick. I love Nutella Frosting, and have used it a bunch. 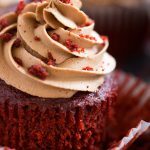 I love Nutella with red velvet, so these Red Velvet Cupcakes with Nutella Buttercream are dynamite. They are also filled with Nutella, so they’re a double whammy. I adore them… one of my favorite cupcakes EVER. 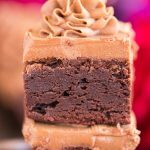 Nutella Buttercream also jazzes up a simple pan of brownies in a big way – check out these Nutella Brownies with Nutella Buttercream. 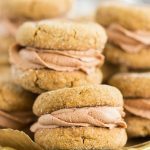 I’ve since also used it sandwiched between cookies in these Soft Ginger Cookies with Nutella Buttercream (sounds like a weird combo, but it’s freaking awesome), and Pumpkin Nutella Whoopie Pies. 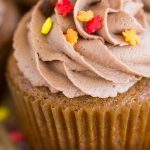 These Pumpkin Cupcakes with Nutella Buttercream are further proof that pumpkin and Nutella DO belong together, trust me. 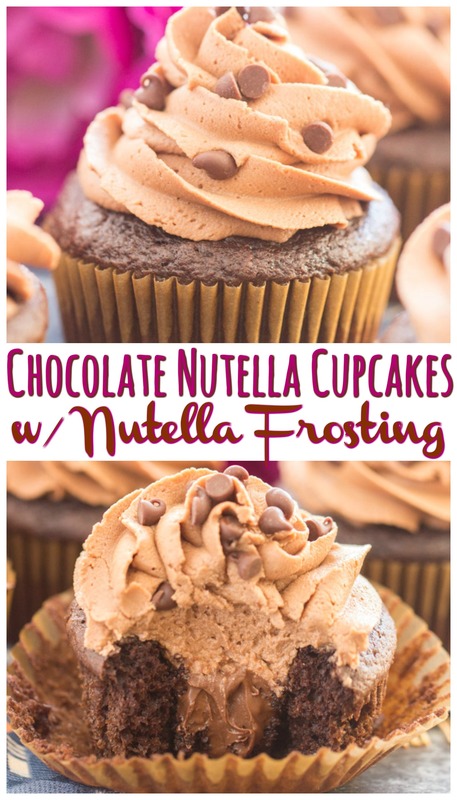 Anyway, Nutella Frosting is the EASIEST and best frosting, so give it a try, and let me know what you think! The mini chocolate chips on top are just a garnish, but you should definitely include them. 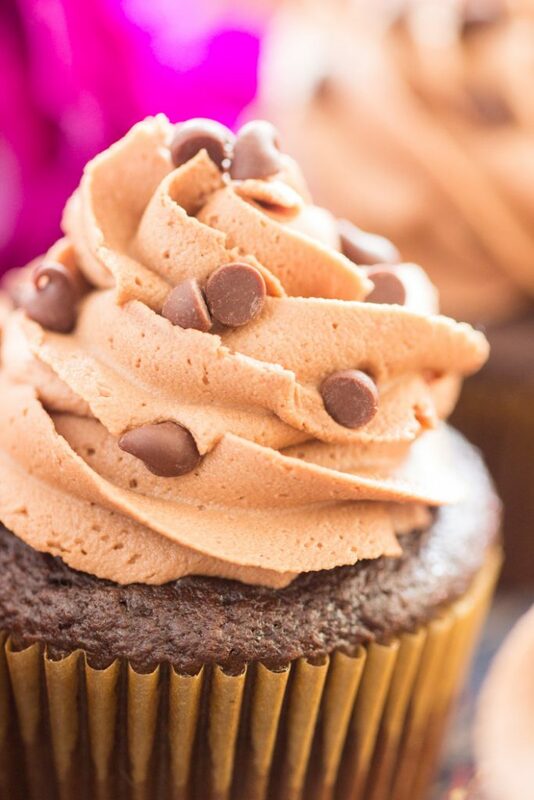 The cupcake is so tender, and the frosting is so smooth and creamy, that the soft crunch of the chocolate chips is a really nice touch for breaking up the texture of these Chocolate Nutella Cupcakes. Consider them essential! I’ve got lots of other great Nutella recipes. Check out this Nutella S’mores Cheesecake, this No-Bake Nutella Cheesecake recipe, and these Nutella Rice Krispie Treats for a few favorites.! Simple chocolate cupcakes, filled with a heaping mound of Nutella, and topped with fluffy Nutella frosting. 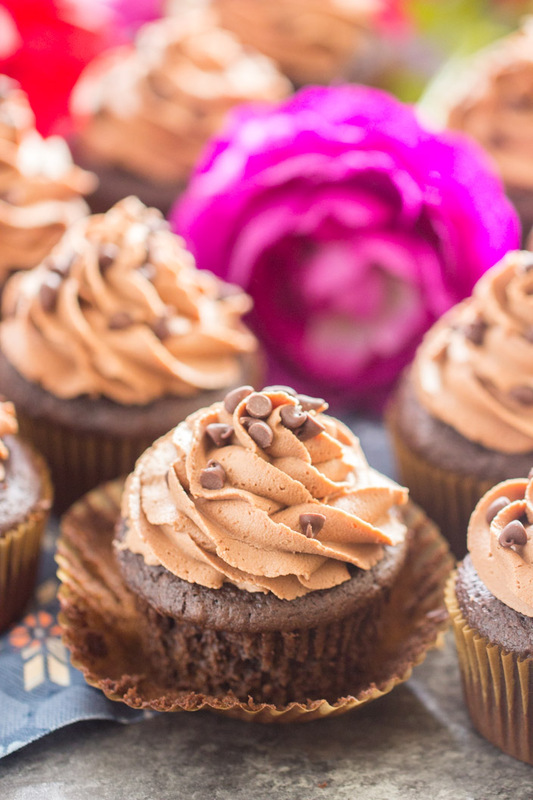 These Chocolate Nutella Cupcakes with Nutella Buttercream are an explosion of chocolate and hazelnut. Spoon a rounded teaspoonful of Nutella into the center of each cupcake. The easiest way to do this is with a small cookie scoop! In a large mixing bowl, beat together butter and Nutella. Add vanilla, 3 tbsp. heavy cream, and 3 cups powdered sugar, beating until light and fluffy, 2-3 minutes. Add additional powdered sugar 1/4 cup at a time, if needed, to achieve a thick, but fluffy frosting. It will be stiff, but should be fluffy and pipable. If frosting is too thick, add additional heavy cream 1 tbsp. at a time. If desired, top cupcakes with a sprinkling of mini chocolate chips.